-Chasse au pédophile : quand la rumeur tue, 40', 2004. ** These films are available in English. Should you wish to host a screening please contact us for rights information. For two years, Marie-Monique Robin traveled across three continents (Europe, America and Asia) to meet pioneers and local heros who, filled with a sense of urgency, decided to build "another world" here and now, so that their children and grandchildren will be able continue to live with dignity. Dissecting and analyzing the dogma of “growth”, the author includes the words of economists, sociologists, and philosophers, who explain how these grassroots initiatives represent a fundamental post-development movement capable of initiating an ecological and economic transition, without which the future of humanity is in danger. 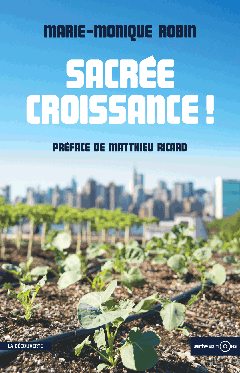 Read an excerpt (in French) here. 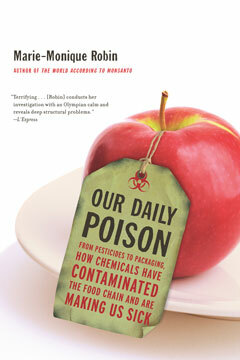 From the prizewinning author of The World According to Monsanto, a shocking account of the dangerous chemical compounds that have infiltrated our food chain. Over the past thirty years, we have seen an increase in rates of cancer, neurodegenerative disease, reproductive disorders, and diabetes, particularly in developed countries. At the same time, since the end of World War II, approximately 100,000 synthetic chemical molecules have invaded our environment—and our food chain. In Our Daily Poison, award-winning journalist and documentary filmmaker Marie-Monique Robin investigates the links between these two alarming trends, revealing how corporate interests and our ignorance may be costing us our lives. The result of a rigorous two-year investigation that took Robin across North America, Europe, and Asia, Our Daily Poison documents the many ways in which we encounter a shocking array of chemicals in our everyday lives—from the pesticides that blanket our crops to the additives and plastics that contaminate our food—and their effects on our bodies over time. Gathering as evidence scientific studies, testimonies of international regulatory agencies, and interviews with farmworkers suffering from acute chronic poisoning, Robin makes a compelling case for action.